Why limit the benefits of design thinking to product development? This specialized way of thinking creates out-of-the-box solutions to problems when it comes to designing new products and services. It has shaken things up in the business world, and its methodology has proven to be useful and applicable to most industries. Now it’s time to bring this method to the eLearning development realm! With design thinking, you’ll be able to analyze all processes and all users more thoroughly to get a well-rounded, integrated view of your course’s impact and how to optimize it. Design thinking gets you people-focused, and since it’s pretty likely most of your learners are people, this is a good place to keep your attention. When adopting this mindset, you learn to make empathy a priority and satisfying the needs of your audience becomes synonymous with success. Making people the center of your design process helps you to understand their requirements, desires and preferences better and work to fulfill them as opposed to trying to merely persuade them to your way of thinking, which is a more common, less efficient way of doing things. To become a Design Thinker, you need to listen to your audience and walk a mile in their shoes, so to speak. This is a far cry from traditional course designing where the focus is purely on how the information will be presented, not on its effects on the learner's life or the goal you want to achieve. You need to be working towards building a better learner experience. That's the most important thing. How to start? Redesign your approach to eLearning development. Start seeing your course design through the lens of your learners' eyes instead of yours. Allow your team to understand and observe your course's target audience and form empathy for them. Observation is far more effective that simple surveys where things don’t get expressed because they are not easily put into words. Observation lets you know exactly what struggles exist and the emotions they go through. Be human and remember whom you’re designing for. 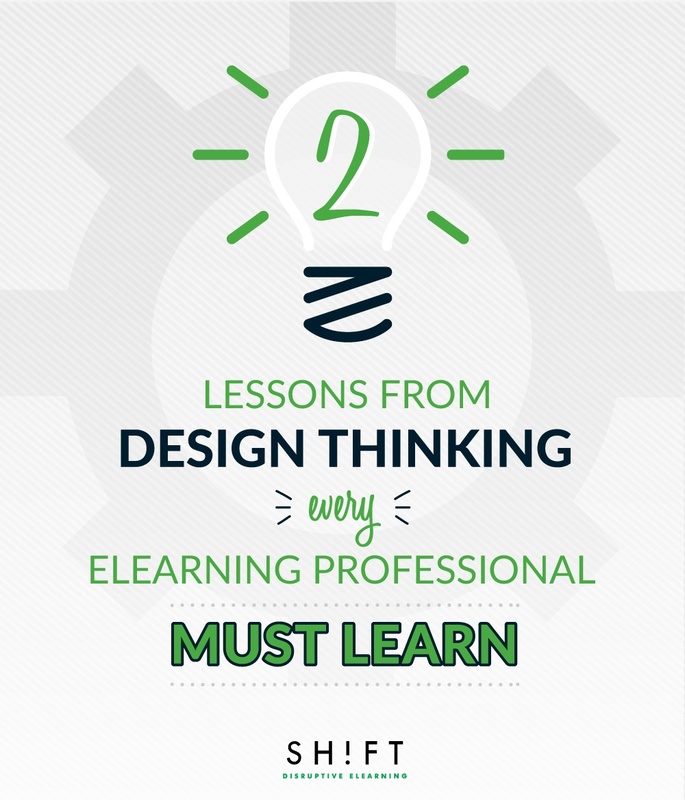 Design Thinking helps you fail at the speed of light, and that’s an amazing thing in eLearning development. Unlike traditional methods for development where a product is only created and sent out into the world to sink or swim; when you enter the Design Thinking world, you get to experiment, fail, tweak, test again and likely fail again too. You go through this process rapidly, quickly changing one element then another until you have worked out all the bugs before it ever reaches your total audience. Even better, these multiple failures save you time and money. This design approach might seem time-consuming and costly, but as you go, you’ll see that there are only so many changes you’ll have to go through. More importantly, figuring them out while in the prototype stage will save you so much heartache over unleashing it on your students only to find it is unusable and you, now, don’t have the ability to take it back. How to start? Ask your team to consider "what would happen if…?" style questions to get the ball rolling on creative thinking. This gets people thinking about all possible scenarios and the outcomes that can result from each until the worst problems and best solutions are all considered to avoid nasty surprises later. Thinking this way shakes eLearning designers out of their tendency to look at things purely on paper and view their eLearning courses as part of the real world where they will be used. What might sound good in theory may not work in real life and it’s better to figure that out in this prototype stage. Consider how freeing it would be to actually be encouraged to fail. No longer would you have to painstakingly develop a course in its entirety before launching only to see a lackluster response from your audience. 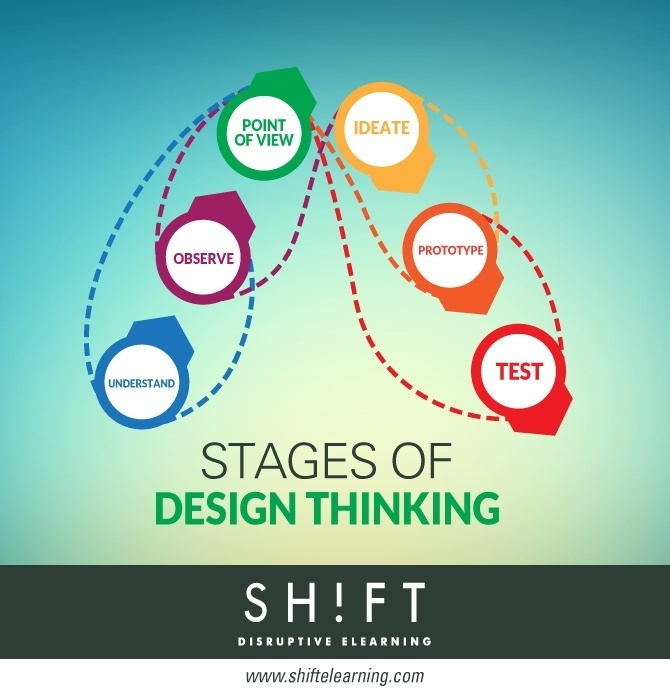 With design thinking methods you will be able to put together fast prototypes and test them out as quickly as possible. Getting comfortable with failure and seeing it for the opportunity for improvement that it is, is just about the best thing you can do for your courses, your learners, your team and yourself. The idea of prototyping is far easier to stomach than calling everything a failure and puts your course design in line with companies who release product to a sample market before going to the general public. Prototyping is quite inexpensive and fast, and it affords you valuable feedback from your users at a time when you can do something with it. Waiting until the product is released to your entire audience means you are only getting feedback after the fact when you can’t do much about it. Also, IDEO CEO Tim Brown reminds designers to learn from your failures "Don't think of it as a failure, think of it as designing experiments through which you're going to learn." If you’re frustrated with your eLearning courses failing to resonate with your audience after they are rolled out, it may be time to approach your design differently. By employing Design Thinking, you focus on your learners and get the benefits of their feedback at the most critical times. Furthermore, you get to learn how to see the opportunity in failure at a point in the development process when you can still use that failure to create success. De Bono, E. (1989). Six Thinking Hats. Educational Psychology in Practice. Schrage, M. (2000). Serious play: How the world’s best companies simulate to innovate. Harvard Business Press. Norman, Don. (2013). Rethinking Design Thinking.